Contractors and Home Builders leave Rain Gutter Downspouts right against your home’s foundation. 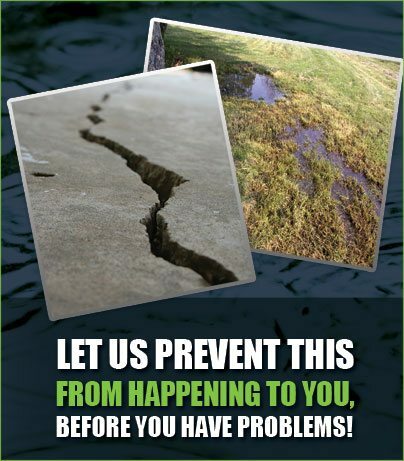 Standing water against a concrete foundation causes settling and cracking which will cost thousands. Instead, install proper water drainage at a fraction the cost. 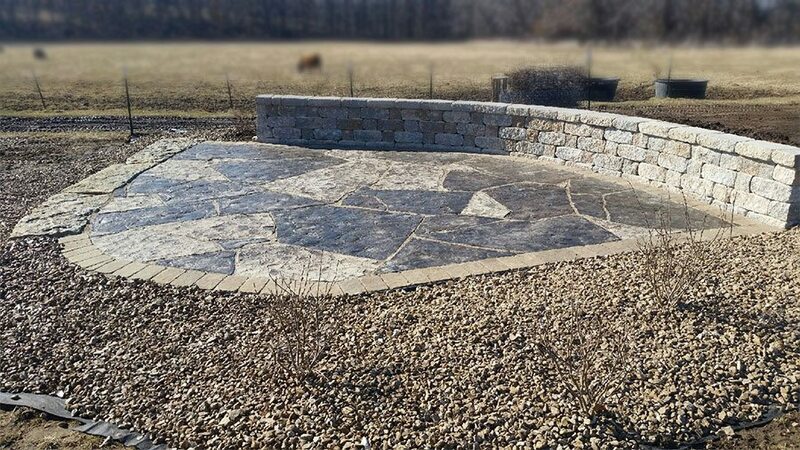 Add additional space or define your outdoor living area with a beautiful retaining wall and paver patio.The design flexibility gives you flowing curves, straight lines, stairways and much more. A properly constructed retaining wall must have an adequate footer, proper back fill materials and appropriate reinforcement behind the wall depending on the load a wall is carrying. Make your yard into an outdoor living space and extension of your home by meeting with us and developing a plan to make your outdoor area a great place to relax and enjoy the outdoors. 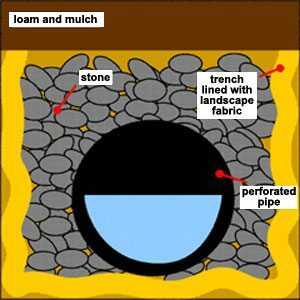 A french drain will aid in preventing standing water and soggy spots in your lawn. Many lawns have a very slight drop in grade or may be mostly flat which can make it difficult for the area to drain properly. If there is an area on the property we can direct that surface water, then a French drain may be your best solution. The downspouts on your home should also be routed or extended to get the the water to flow where it should. Many times this can be done in tandem with installing a drain system to get the water where it needs to go. Due to our installation procedures and quality controls, our french drain pipes will never clog! We use a heavy soil separation fabric to keep the drainage rock from being silted or clogged with soil. We also use a 3,000 pound crush pipe, not the black corrugated pipe that is prone to collapse over time. We’ve been able to solve many drainage issues for homeowners in the Columbia area and would be glad to provide references. We begin with excavating a trench which allows water to naturally flow away from the problem area using only the force of gravity. 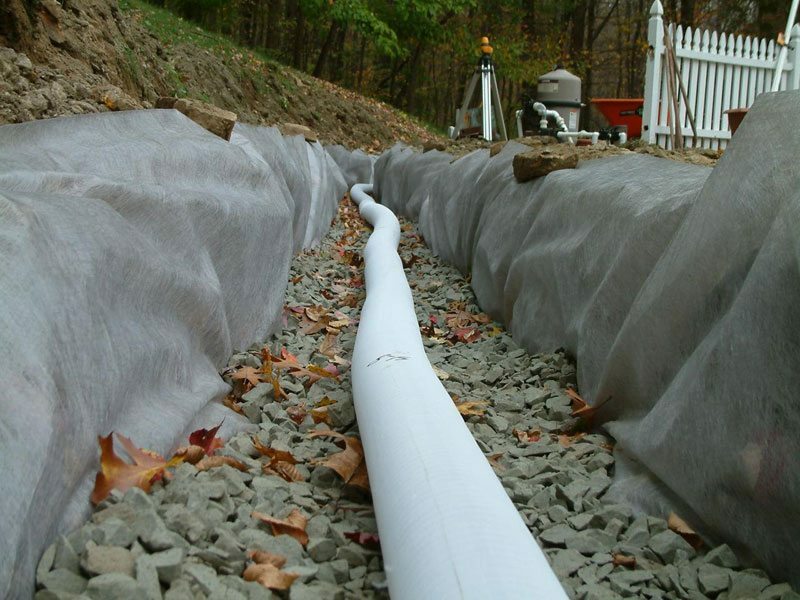 Soil separation fabric lines the trench, which prevents silt from washing into the drain rock and clogging your system. We use one inch clean rock to carry light water loads away from the problem area. The piping carries heavy rainfall quickly away. Three inches of topsoil covers the entire system, restoring the original appearance of your lawn and allowing for healthy grass cover. When completed the Perfect French Drain by Jolly Lawncare is totally invisible, and your drainage issues are gone!